How good must a Good Turn be to be good? The answer is best given by telling you the story of how Scouting came to America. It shows that it isn’t the size that counts. What is important is the spirit with which a Scout does a Good Turn. One day in 1909 in London, England, an American visitor, William D. Boyce, lost his way in a dense fog. He stopped under a street lamp and tried to figure out where he was. A boy approached him and asked if he could be of help. “You certainly can,” said Boyce. He told the boy that he wanted to find a certain business office in the center of the city. “I’ll take you there,” said the boy. When they got to the destination, Mr. Boyce reached into his pocket for a tip. But the boy stopped him. “No thank you, sir. I am a Scout. I won’t take anything for helping.” “A Scout? Now what might that be?” asked Boyce. The boy told the American about himself and his brother Scouts. Boyce became very interested. After finishing his errand, he had the boy take him to the British Scouting office. At the office, Boyce met Lord Robert Baden-Powell, the famous British general who had founded the Scouting movement in Great Britain. Boyce was so impressed with what he learned that he decided to bring Scouting home with him. On February 8, 1910, Boyce and a group of outstanding leaders founded the Boy Scouts of America. From that day forth, Scouts have celebrated February 8 as the birthday of Scouting in the United States. What happened to the boy who helped Mr. Boyce find his way in the fog? No one knows. He had neither asked for money nor given his name, but he will never be forgotten. His Good turn helped bring the Scouting movement to our country. In the British Scout Training Center at Gilwell Park, England, Scouts from the United States erected a statue of an American buffalo in honor of this unknown Scout. One Good turn to one man became a Good Turn to millions of American boys. Such is the power of a Good Turn. The man who started the Scouting movement. Robert Baden-Powell, spent much of his life serving in the British cavalry. He received his early military training in India, then served in Africa. At the turn of the century he was an officer in the war between Britain and the descendants of Dutch settlers. The Boers, in South Africa. He gained world fame during the war by defending the town of Mafeking against a force of Boer soldiers. He stood fast for 217 days until another British army broke through the enemy lines and lifted the siege. Baden-Powell came home to England as the best-known hero of the Boer War. He decided to use his fame to help British boys become better men. He based his ideas for a boys’ organization on his own experiences as a youngster in England and as a soldier in India and Africa In 1907 he invited a group of boys to attend the world’s first Boy Scout camp on the English island of Brownsea. The success of the camp led him to write a book he called Scouting for Boys. It was an Instant bestseller. Boy by the thousands bought it and decided to become Scouts. Scouting spread like wildfire throughout England and, before long, around the world. Among the founders of the Boy Scout of America, Eeriest Thompson Seton and Daniel Carter Beard were skilled at living outdoors. Both had written books about camping and nature study, and both had developed their own outdoor programs for young people. Seton became the first Chief Scout of the Boy Scout of America. Beard served as the National Commissioner. James E. West, a young Washington laywer, became the first Chief Scout Executive of the young organization. His own childhood had been Difficult. His father had died before he was bore. His mother passed away when he 7 years old, and West was raised n an orphanage. He suffered from an illness that made it difficult for him to walk. Despite these hardships, he put all his ambition, ability, and energy into becoming a sawyer. He succeeded and then dedicated himself to helping all children – sick and healthy, sick, and disabled – to have a better life. James West gave the Boy Scout of America 32 years of strong, wise leadership. His efforts helped build Scouting into the largest organization for boys in the country. The boys joining the new Boy Scouts of America needed a manual of their own. Published in 1911, the BSA’sHandbook for Boy’s was an American version of Baden-Powell’sScouting for Boy’s. It was packed with information about hiking and camping, forming patrols, and having fun in the outdoors. The book also described activities for Scout troops and listed the requirements for Scout ranks and merit badges. The Scout handbook has been revised 11 times to include the latest developments in Scouting and outdoor adventures. Since 1911, more than 33 million copies of the Boy Scout Handbook have been printed, That makes it one of the most popular American book of all time. When he became Chief Scout Executive, James West felt that the Boy Scouts of America needed a magazine. Scouts reading a good publication could share the best Scouting had to offer. 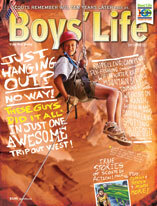 In 1912, Mr. West and the BSA national office began printing a magazine they called Boys’ Life. Today, more than 2,000,000 Scouts receive Boys’ Life every month. Each issue is filled with terrific stories, camping hints, and Scout projects. James West’s good idea has become a very importance part of Scouting. Service to others has been a vital part of Scouting since its beginning. Individual Scouts have done millions of Good Turns of all descriptions. Patrols and troops have organized to carry out worthwhile projects for their communities. They gave gathered food and clothing for needy neighbors, built playgrounds, and repaired parks and public building. In times of emergency, they have assisted fire and police departments, aided in the evacuation of flood victims, and cleaned up after storms. Service on a national scale started when the United States Became involved in World War I. Boy Scouts throughout the country sold bonds to raise money for the war effort. They collected recyclable paper and metal. Their efforts showed the public an important side of the Scouting program. The Congress of the United States signaled its support by granting a charter to the Boy Scouts of America. Scouts today carry on this tradition of service in their homes, communities, and nation. In recent years, Scout service has led to more active roles in caring for the land. Scouts not only enjoy going outdoors for adventures, they also see themselves as good stewards of the land, working with park and forest rangers to complete a wide variety of conservation and restoration projects. By 1920, Scouting had spread around the world. To strengthen this world brotherhood, Baden-Powell invited Scouts from all nations to a world jamboree in London. He wanted young people from many countries to camp together, share their skills, and develop friendships. The first jamboree was such a success that Scouting’s leaders promoted the idea of more worldwide gatherings. With the exception of the World War II years, world jamborees have been held every 4 years. Since 1937, the Boy Scouts of America has held one national jamboree between every two world jamborees. As many as 50,000 Scouts have attended each gathering. Through the years, the Boy Scouts of America has continued to grow. To serve the special needs and interests of Scouts, the BSA has developed a variety of programs. Sea Scouts began in 1912 as a branch of Scouting for older boys. Eventually it became Senior Scouting, which proved to be very popular. Today, Exploring is the program for young men and woman in the Boy Scouts of America. The Lone Scouts of America merged with the BSA in 1924. An organization for boys who lived in sparsely populated areas of the country, the Lone Scouts had been founded by William Boyce. In 1930, a younger-boy program, first called Cubing but now known as Cub Scouting, began drawing boys form age 8 and up into the movement. Tiger Cubs, BSA, was added in 1982 to serve boys younger than 8 and their families. Varsity Scouting, added more recently, rounds out the program of the boy Scouts of America. From its beginning with a Good Turn by an unknown Scout, to the present with millions of Scouts across the nation, the Boy Scout, to the present with millions of Scouts across the nation, the Boy Scouts of America has had a colorful, exciting, and important history. Now that you are a Scout, what does the future hold for the organization? Well, that depends on you. Like that British Scout on a foggy London street, you never know when a simple act of kindness can have far-reaching effects on another person, an entire organization, or even the world. Taken from, The Boy Scout Handbook, Tenth Edition.